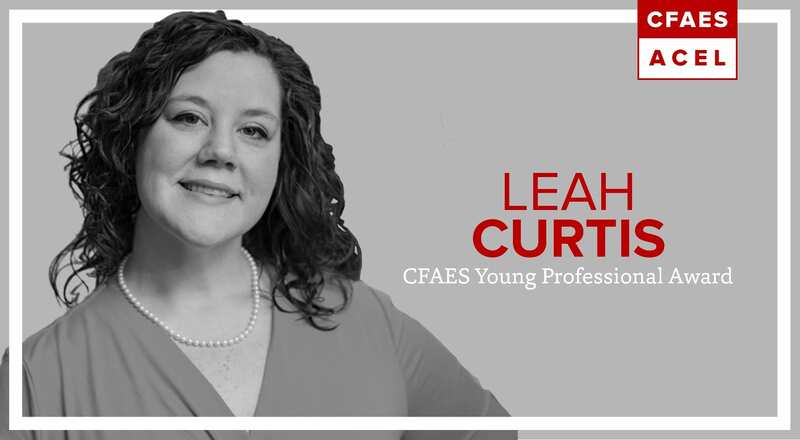 Leah Curtis currently works for the Ohio Farm Bureau Federation as the policy counsel and senior director of member engagement. She manages a team of three membership engagement professionals and providing legal guidance to the Ohio Farm Bureau Federation policy department. Recently her work was presented before the Supreme Court of the United States. Curtis is a strong advocate for the interests of Ohio’s farmers and landowners. She serves on the Ohio Department of Taxation’s Agricultural Advisory committee. She has a podcast “Legal with Leah” that is the highest click-thru rate in the Ohio Farm Bureau’s electronic newsletter. An episode of her podcast has also received the “Best Audio News Story”. Curtis was selected to take part in the 2014-2015 Ohio State Bar Association Leadership Academy. She was also appointed to the Bar Association’s membership task force and to the Women in the Profession Section Council. Leah currently serves as the vice-chair of the Bar Association’s agricultural law committee. Leah is a great supporter of CFAES and its students, where she regularly comes to Agricultural Communicators of Tomorrow meetings and has been an influence in the AGRCOMM 2367 course. She is known or her service and dedication to help others, which is seen throughout organizations such as the Southeastern Ohio Legal services and Ohio FFA Association. Henney is very involved within CFAES, especially at Ohio State ATI. He is keen on the educational development and knowledge of Ohio State ATI students, and has a unique perspective on how the Ohio and U.S. legislature activities affect agriculture in Ohio. His interaction has expanded Ohio State ATI students’ overview of agriculture and made them more aware of the policy implications. Henney is instrumental in helping Ohio State ATI students receive OABA Annual Scholarships totaling $3000 each year. He also ensures that the scholarship recipients interact with leading national and Ohio agribusinesses. He is a strong supporter of CFAES in both Columbus and Wooster. 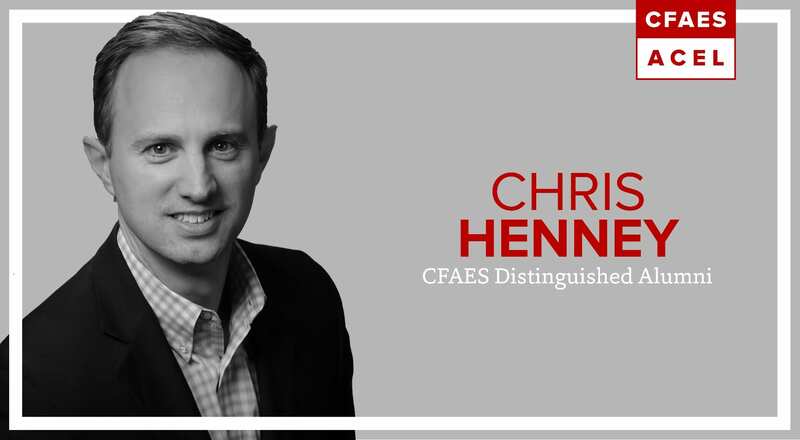 Congratulations Chris on your recognition as a CFAES Distinguished Alum! 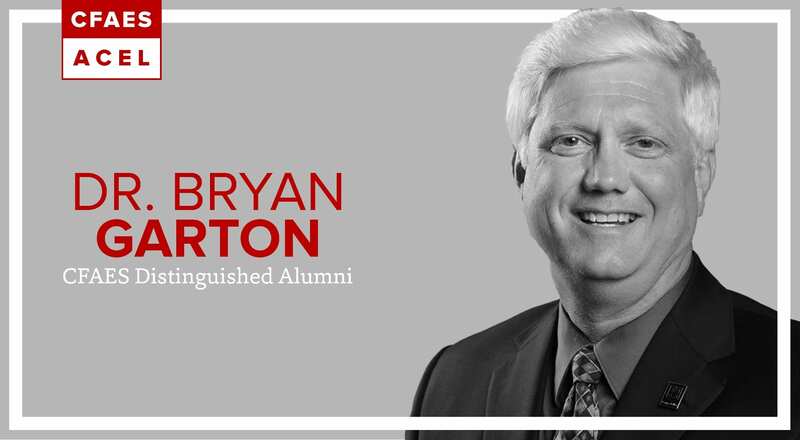 Dr. Bryan Garton is currently associate dean of academic programs in the College of Agriculture, Food and Natural Resources (CAFNR) at the University of Missouri (MU). Dr. Garton’s academic roots extend to the Department of Agricultural Education and Leadership at MU, where he served the ranks of Assistant, Associate and Full Professor. He has received prestigious awards including induction as an AAAE Fellow, Kemper Teaching Fellow, and many research journal article and conference paper awards. Dr. Garton has been recognized in numerous ways at the University of Missouri for his teaching excellence at both the undergraduate and graduate levels. Within the profession, his recognition is continued as a teacher educator and researcher. His reputation for mentoring graduate students is well-documented by the number of students whose career successes as university professors include leadership titles such as Assistant Dean, Department Chair, Teaching Center Co-Directors and Provost Faculty Fellow from universities across the country. Dr. Garton is proud to be an Ohio State graduate and in particular, a graduate of this college and our department. He credits his experiences at Ohio State for preparing him for success as a teacher and researcher. Congratulations Dr. Garton on your success as an agricultural educator and your recognition as an outstanding alum of CFAES! In 2002, Dr. Robert J. Birkenholz assumed the role of Professor and chair of the then-named Department of Human and Community Resource Development or HCRD. Birkenholz provided important leadership during a time of financial struggles for Ohio State and amidst a department finding its identity. In 2009, Bob stepped out of his role to be a professor for what is now the community leadership major and the campus-wide leadership studies minor. He is an important reason why we have the L in ACEL. Bob’s career is decorated with numerous awards for teaching and advising. In Spring 2018, the CFAES Celebration of Students banquet was dedicated in his honor. He has received several research awards for conference posters, conference papers, the Journal of Agricultural Education and NACTA Journal. He has received the Honorary State FFA Degree in Missouri and Ohio and the Honorary American FFA Degree. Of particular awards of note: Bob was named the Distinguished Lecturer for the American Association for Agricultural Education (AAAE) and was also named Fellow for AAAE in 1998. Bob’s legacy of giving to students continues in perpetuity at Ohio State with the Birkenholz Leadership Award Fund established in 2010 by him and his wife, Pam. On September 1, 2018, Bob officially retired from Ohio State and earned the title of professor emeritus. 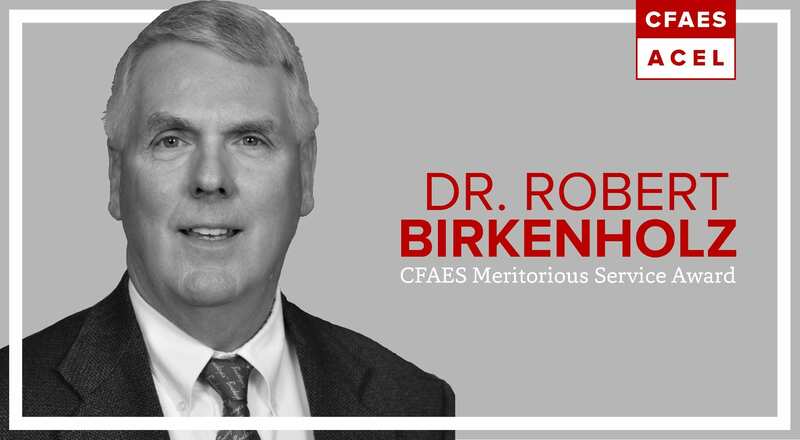 Congratulations to Dr. Bob Birkenholz on your recognition for your service to CFAES! Five students from the Department of Agricultural Communication, Education, and Leadership were recently selected to join the College of Food, Agricultural, and Environmental Sciences (CFAES) Ambassador Team. 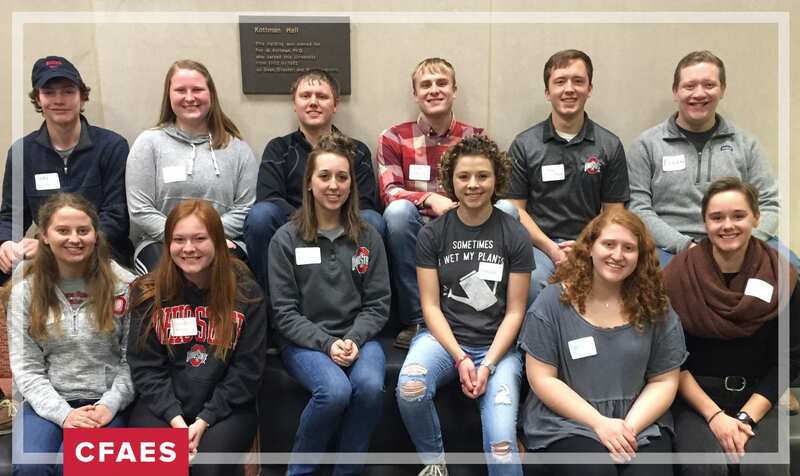 The CFAES Ambassador Team members give prospective families tours of our college campus, serve as liaisons to the Ohio State student body to increase awareness around our college and attend CFAES events as representatives of the college. These five students join 12 ACEL students currently serving as a CFAES Ambassadors. They include: Emma Lynn Johnson (community leadership), Wyatt Jones (agriscience education), Taylor Lutz (agriscience education), Cody McClain (agriscience education), Micah Mensing (agriscience education) Abby Motter (agriscience education), Cody Myers (agriscience education), Meredith Oglesby (agricultural communication), Milan Pozderac (agriscience education), Sydney Snider (agricultural communication), Kayla Walls (agriscience education) and Meghann Winters (agricultural communication). CFAES ambassadors are selected each Spring Semester through an application and interview process. The Department of Agricultural Communication, Education, and Leadership (ACEL) at The Ohio State University recognizes this week, February 16-23, 2019, as National FFA Week. This celebratory week was founded in 1947 and embraces more than 91 years of FFA traditions. Nationwide, nearly 670,000 FFA members will participating in activities at local, state and national levels. These members have a passion for agriculture. 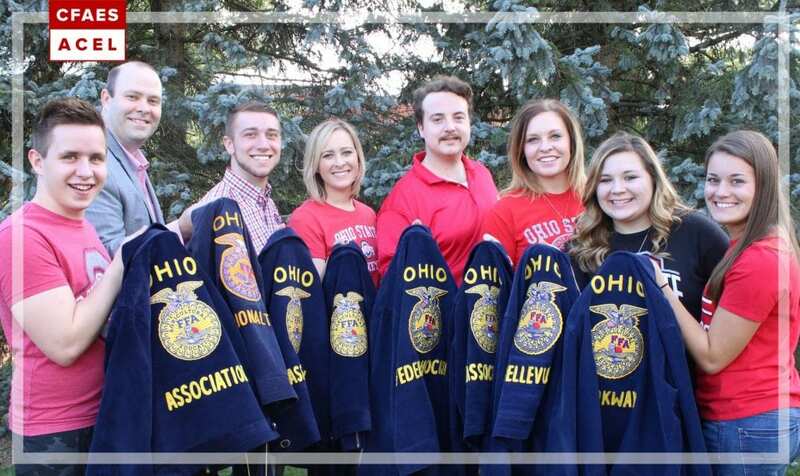 ACEL is connected to the National FFA Organization, as it one of three universities in Ohio to prepare undergraduate and graduate students to teach agricultural science in secondary high schools and serve as advisors of local FFA chapters. Agricultural education programs prepare students for successful careers and a lifetime of informed choices in the global agriculture, food, fiber and natural resources systems. Agricultural education instruction is delivered through three major components: classroom/laboratory instruction (contextual learning), Supervised Agricultural Experience programs (work-based, experiential learning) and student leadership development (National FFA Organization). The agriscience education major at Ohio State provides students with a rigorous series of courses in technical agriculture, education psychology, instructional methods and youth development. Ohio State currently has approximately 100 students majoring in agriscience education. During the current Spring Semester, 15 students are completing the student teaching experience in classrooms around Ohio. ACEL was founded in 1917, mere months after the passage of the Smith-Hughes Act that federally funded vocational agriculture programs (now known as agricultural education programs) across the country.